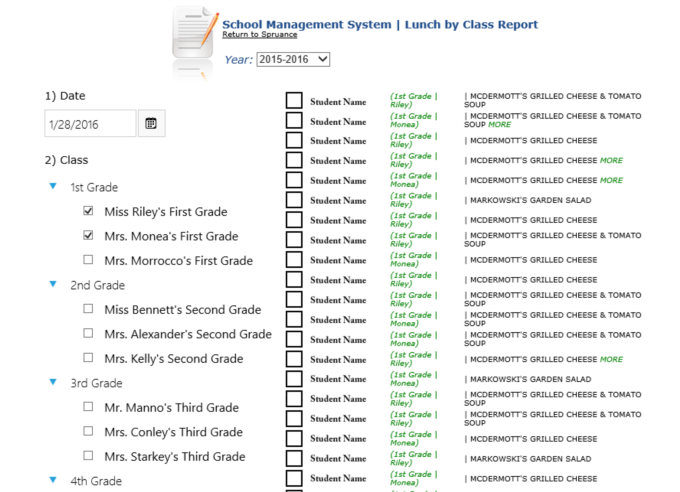 Go paperless with a simple and intuitive user experience for both lunch adminstrators and parents. The following is information regarding the tools and features for parents. Parents access the hot lunch system with secure credentials provided either by the school or requested through the system. 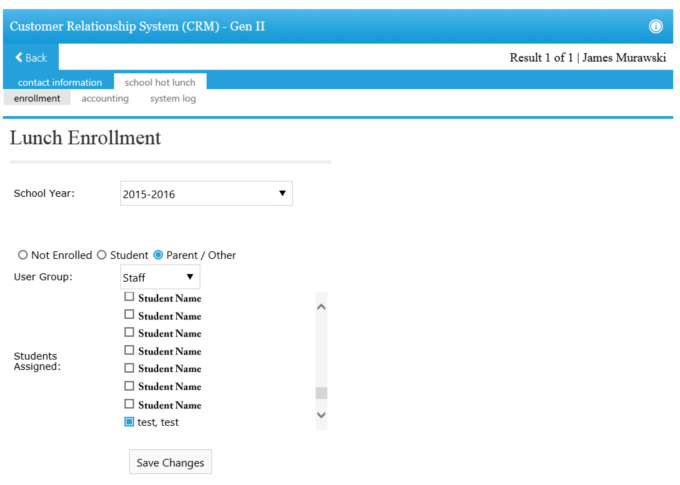 Once the parent is in the system, they will have access to the entire lunch program and features. 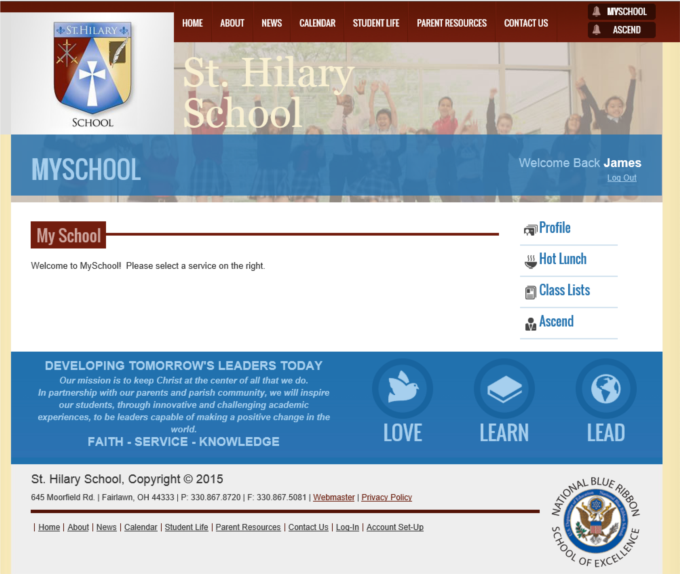 Provide a fluid and easy user experience by having the Hot Lunch Program integrated directly into the school website. By having Daslos Studios update or create your school website, we can incorporate the tools and features that you want. 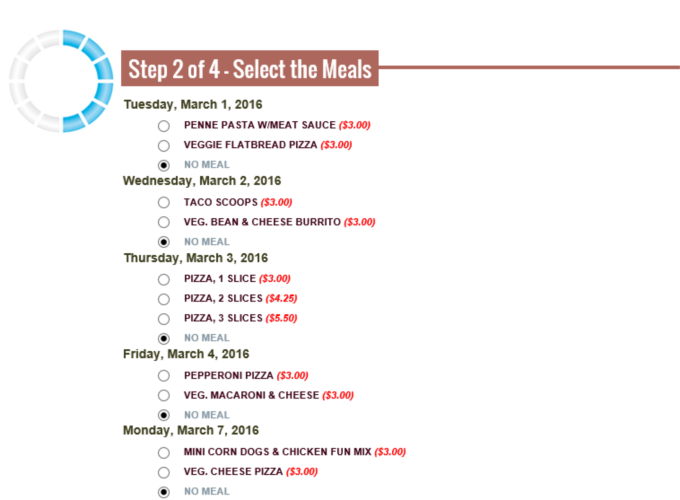 If there is an open month for ordering, the parent can go in and quickly select from the available meal options for each day of that month. Using a simple selection process, the orders are quickly put together for one or more children. The order is not fully submitted until payment is accepted, which is done online via PayPal or Authorize.NET. Orders for one or more children can be paid online using a credit card through either the PayPal or Authorize.NET payment gateways. The parent is automatically taken from the website to a secure page on the processors site for the transaction and then returned when complete. This seamless process allows the schools and parents to not worry about their credit card information or costly site security. All the financial information is completed on these enterprise class E-Commerce platforms. 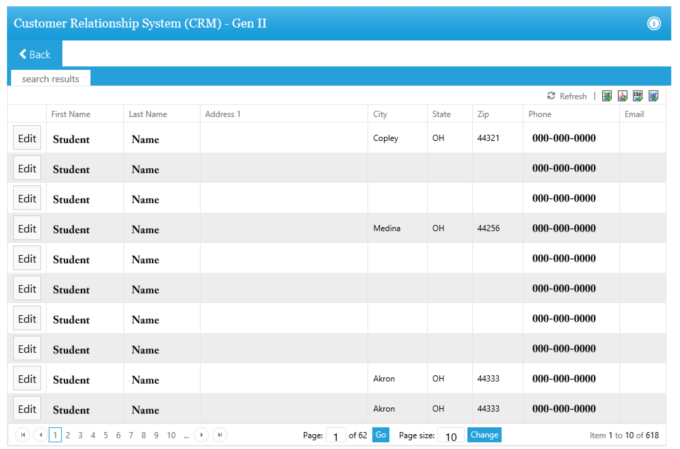 The system will show the parent the complete history of the each childs account and past orders. This transparency will allow parents to know what was paid for, and when. "give it a try for yourself"
We can setup a trial account for you to try for 30 days, free of charge. We can set you up with a fully operational system so that you can test it out and make sure it is the right choice for your school. These items allow administrators to properly setup their Hot Lunch Programs to match their individual school needs. 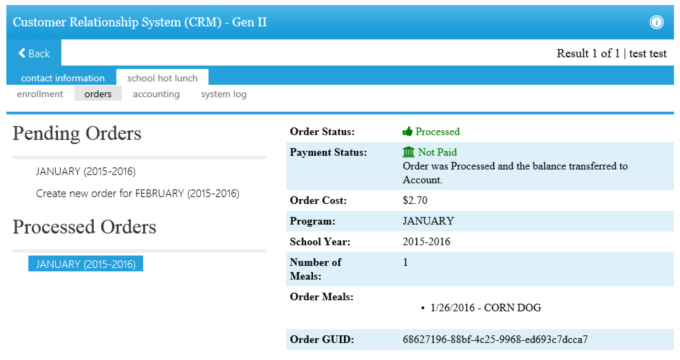 The Hot Lunch Program works much like a credit card account. 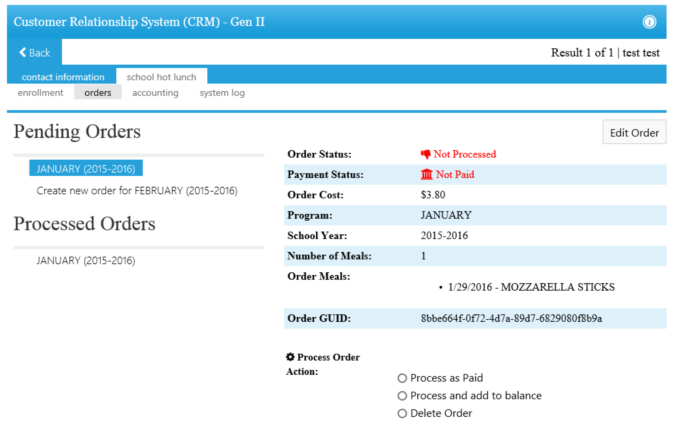 Orders are placed for individual students and the system tracks the expense against their account. When the payment is submitted either via Online E-Commerce or other method, the payment is tracked against the balance in the system. This is also how additional features such as Forgotten Lunch charges, snow days, and other unexpected activities are achieved. They are simply applied to the user account and either applied to the next order or added to the next charge. The account information is tracked throughout the history of the account and administrators can view that history and get quick details on each individual transaction that has ever occured. 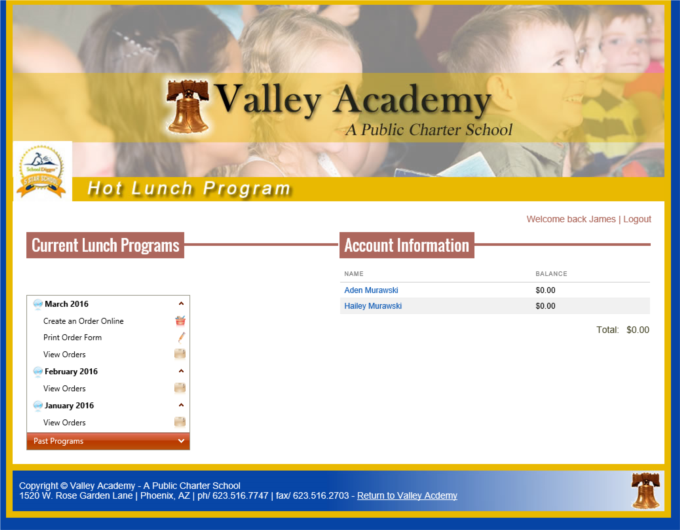 The Hot Lunch Program allows administrators to quickly apply charges or credits to any account. Forgotten Lunches are a snap, as an administrator will simply look up the child select the day and the lunch that was provided, either a standard "forgotten lunch" or an extra from the regularly scheduled lunch meals for the day. The system will automatically update the student financial account and the master order count. 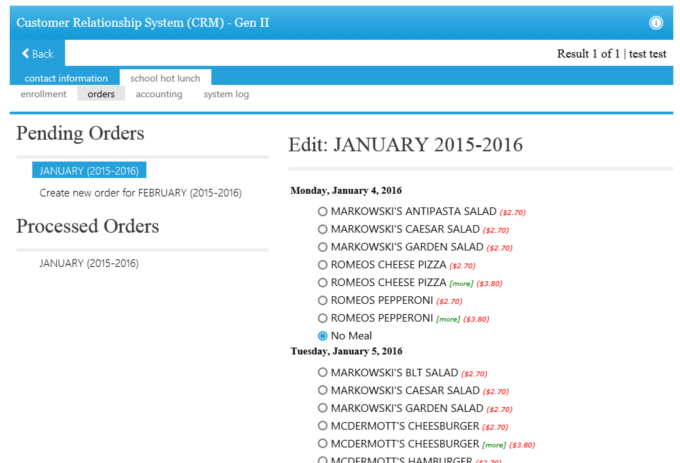 Administrators are able to view every single order that has been processed for each individual user in the system. They can see information to include the date, cost, payment method, notes, and even E-Commerce payment details. Orders that have been started, yet not completed in the system will also appear, allowing administrators the ability to quickly complete orders in the event of user error or a problem with the payment gateway. Entering the meal options can be time consuming, especially if there are a lot of repeats from month to month, even week to week. 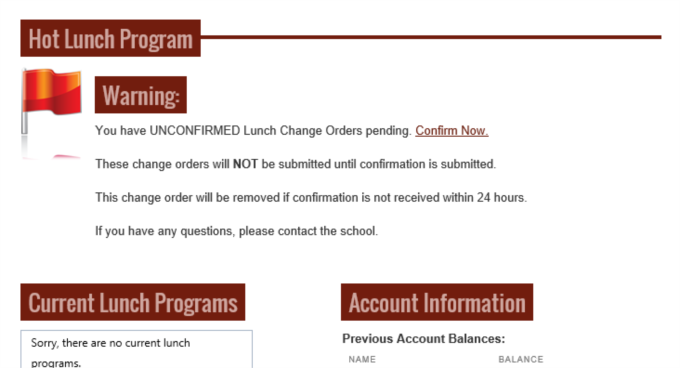 To help with the process, the system allows the administrator to create Favorite Meals that can be applied to any order period, saving a lot of time. 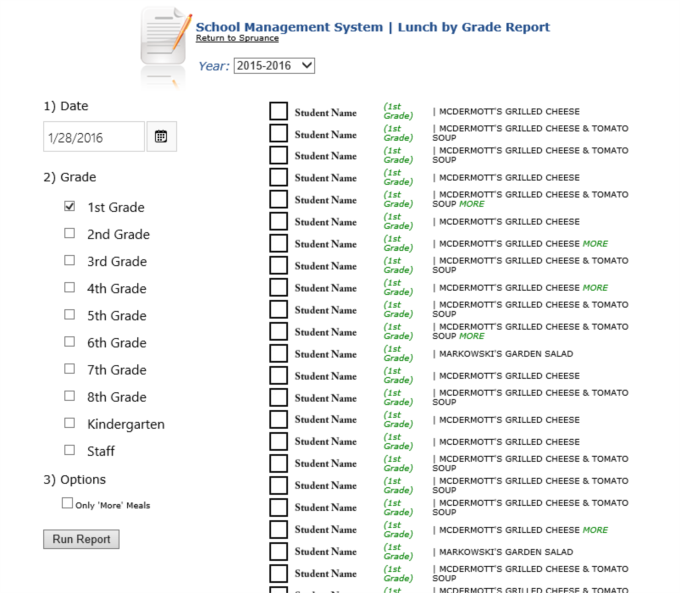 With as many moving pieces as a lunch program has, having accurate and real-time reporting on the program is vital. 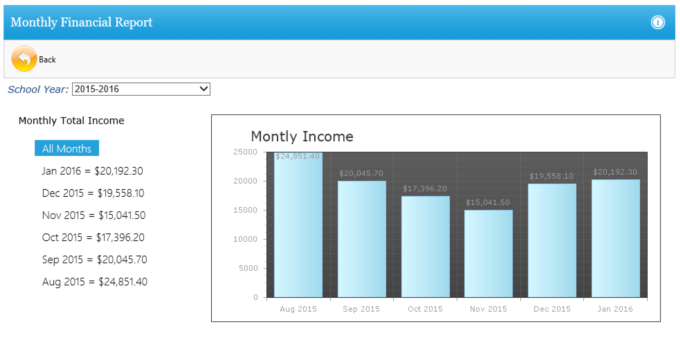 The system has two main types of reports. The first is regarding the lunch orders themselves. 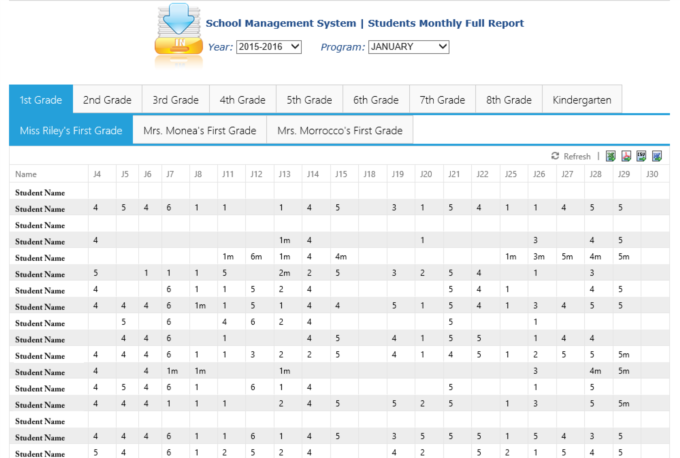 There are seveal reports to choose from, including orders by grade, classrom, month, or ordering period. The reports are generated each time with real-time information in them to ensure accuracy. The second kind of reports is for overall health and fiscal accounting of the lunch program. Reports include outstanding balances, daily payment reports, monthly financial repots, and more. This helps ensure that the system is under control and lost revenue is avoided. 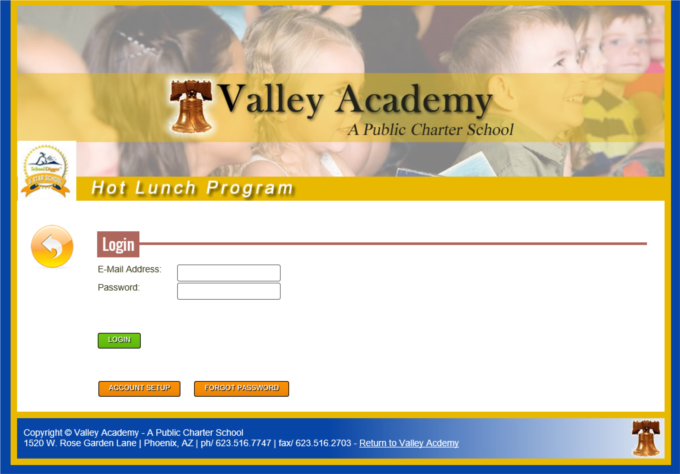 The Hot Lunch Program can be setup to either operate with the PayPal or Authorize.NET payment gateway systems. The secure transactions occur on the gateway provider's secure website, reducing costly additional security and giving peace of mind. The users, in the payment process, are taken automatically to a secure payment page on either PayPal or Authorize.NET servers and then returned when the payment process is completed. 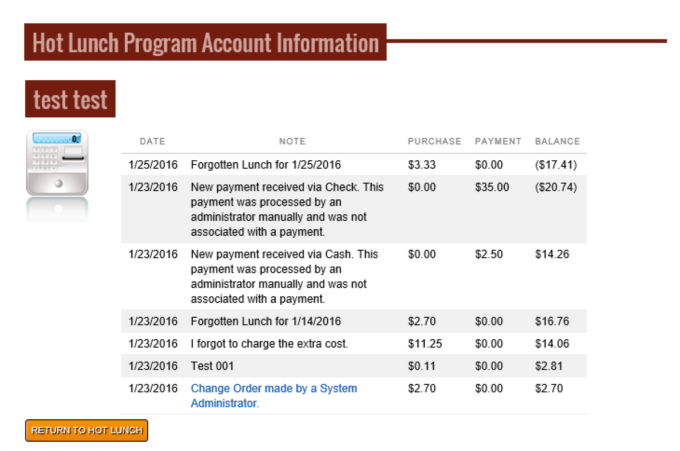 The payment gateway then sends a special code in the background to the system, letting the Hot Lunch Program to know if the payment has been accepted or not. Currently the Hot Lunch Program is in its third generation release, and has seen a lot of changes over the years. Ideas for improvements and changes have always come from the users and clients of the system. They have helped make the system what it is today and as new clients are added and the system continues to be expanded, we welcome new ideas and suggestions. The Lunch Program, the same as with Spruance itself, will continue to evolve and improve on itself, and we stay flexible to achieve just that. The systems are not "boxed solutions" rather living code built upon enterprise class Microsoft technology with the committment that it will grow with the clients. Ok, for the nerds in the bunch. 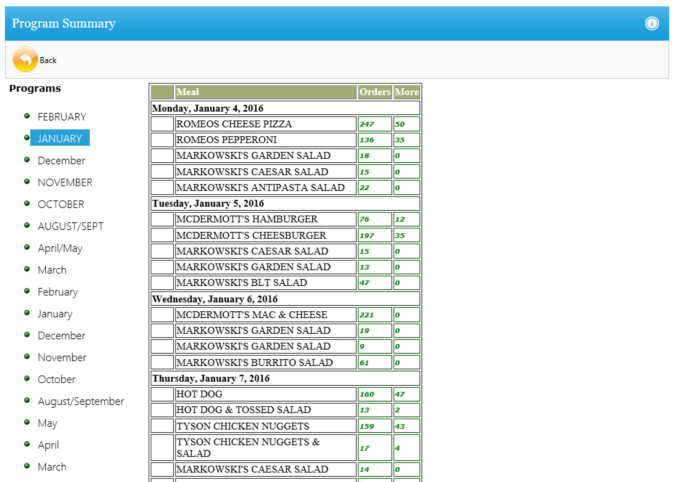 The Hot Lunch Program and Spruance systems are written using the .NET framework from Microsoft. Our sites are all custom C# web applications running on a enterprise cloud server running Windows Server 2012, with 24/7 monitoring and backup services. Our website are database driven, utilizing the powerful Microsoft SQL Server 2012 engine, meaning that your sites are built upon a solid Technology Foundation. Call 330.952.2857 for more information. All websites are stand alone custom solutions, meaning that alterations and changes to features and functionality are not only available -- but encouraged.